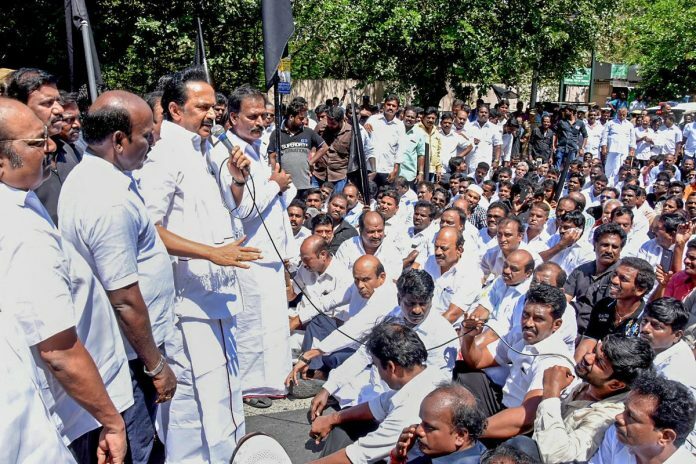 The DMK, in its plea, said the reservation does not apply to those communities which were ostracised for centuries in matters of education and employment. Chennai: The DMK moved the Madras High Court Friday challenging the central government’s decision to provide 10 per cent reservation in employment and education to economically backward classes, saying it “offends” the basic structure of the Constitution. The Dravida Munnetra Kazhagam (DMK) claimed in its plea that reservation is not a poverty alleviation programme but is more in the nature of social justice to uplift communities that have not had access to education or employment for centuries. “Therefore, essentially, the exception to the equality clause is only available to those communities which were ostracised for centuries in matters of education and employment. Economic criteria has been, however, used as a filter to exclude the creamy layer, persons belong to the backward classes but who are economically advanced,” DMK organising secretary R S Bharathi said in the petition. “Hence, application of economic criteria solely is not contemplated as an exception to the rule of equality and consequently to provide reservation solely on economic criteria offends the basic structure of the Constitution,” he added. The petitioner said, “It is well settled that the ceiling limit of 50 per cent in reservation is also part of the basic structure and has been asserted by the Supreme Court in several cases. “However, in Tamil Nadu, the ceiling limit is 69 per cent due to the Tamil Nadu Backward Classes, Scheduled Castes and Scheduled Tribes (Reservation of Seats in Educational Institutions and of appointments or posts in the Services under the State) Act, 1993 which is placed in the IX Schedule,” he further submitted. Legislations placed in the IX Schedule of the Constitution cannot be legally challenged. Hence, reservation cannot be beyond 69 per cent in the state. However, the recent amendments enable reservation to go up to 79 per cent and the same is “unconstitutional”, he said. He contended that the power to amend the Constitution is subject to the limitation that the basic feature of the Constitution cannot be destroyed by such amendments.